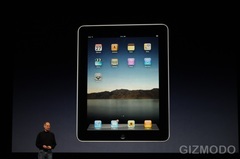 Steve Jobs unveiled Apple’s slender 10 inch touch screen device in Cupertino this evening. “It’s a revolutionary magical product” Steve Jobs told a breathless audience, running through Apple’s successes. Gizmodo liveblog reported Steve Jobs as saying. Looks exactly like the rumours from the last few months… it’s a big iphone..
– One 1ghz Apple custom chip. 64 ghz of flash storage, wifi. – Can you use it to take a phone call? no, doesn’t look like you can.